> Swami Prabhavananda's edition of Srimad Bhagavatam contains what for me is an amazing contention on the meaning and purpose of religion and its intellectual counterpart philosophy. Serious students of the two related subjects can never challenge the statement that forms a profoundly beautiful starting point for studies in the science of religion. Srimad Bhagavatam says, "Religion is not for the purpose of securing a place in heaven. It is an enquiry into Truth, and its ideal is the knowledge and the realisation of Truth". > Statements of this kind always make the science of religion a most worthwhile and meaningful study. I find myself in the fortunate position of being both a scientist of religion and one able to examine the more lasting elements of the subject through Hindu eyes. The study of world religions will only have its value for humanity if it is understood that the basis of such study is the search for Truth. It is the task and intention in the first part of this paper to give some indication of the theoretical foundations of the insights that emerge and some elements of the cultures they give rise to. The paper will refer often to the word Truth. This must be recognised as the intention to distinguish between verifiable insights that challenge us spiritually and intellectually and the many claims to religion that are never verified. > Comprehension begins with familiarising ourselves with the claims some religions make about their respective origins and reasons for existence. The compelling objective of this paper is to comprehend as meticulously as possible the most essential aspects of religion, their meaning, the cultures they give rise to and their contribution to the cultural heritage of all humanity. Science needs to ascertain how precisely we view the belief systems that arise and the corresponding expressions that emanate from their respective positions on religious truth. A further objective would be to determine how beliefs give rise to religious behaviour. > The study must place in context our understanding of how they function in society and the nature of their contributions to, among other things, cultural harmony. This paper suggests that a global reconfiguration of the information we have on the truths human beings value most intensively is very necessary. This is particularly true of the ways cultures express themselves and the perspectives we develop on such expressions. From this then arise the structures of our various identities as religious communities and their value for human society. The intellectually rigorous challenges the science of religion offers has to result very crucially in some serious explanations for much that is incongruous and incomprehensible in religion, and more especially, religious behaviour. > Consider the parameters within which we are allowed to reason to make our study more academically valid. We are sometimes told that it is perhaps in India more than in any other country that the conflict between secular knowledge and religious knowledge raged for many millennia. Religions have a habit of sometimes claiming infallible knowledge in their field. Religion in India has been told that it covers only one aspect of life. Science clings to rational reason to gain knowledge of life in totality. > Swami Vivekananda held very strongly to the view that the methods that apply in science for intelligent perception of the external world require very much the same rational understanding of the internal world. Stephen Hawking suggested that if a complete theory is to be formulated it should in time be understood even if only in broad principle by everyone, not just a few scientists. There is need, he said, for philosophers, scientists and if you'll pardon the description 'ordinary people', to be able to take part in the discussion to determine why we exist and why we express ourselves as we do in religion. "If we find the answer to that" says Stephen Hawking, "it would be the ultimate triumph of human reason. For then we would know the mind of God". > The dialogue between Narada and Sanatkumara in Chhandogya Upanishad epitomises the desire many have for knowing religious Truth at super ordinate levels. Sanatkumara held the view that all knowledge, whether of the Vedas or astronomy or even of philosophy is but secondary. He maintained that all science is secondary and only that which makes us realise Brahman is supreme knowledge. Knowledge of science, we are told, covers only one part of all that humans need to know of themselves and our world. There has to be an attempt to gain the most comprehensive view of the world and the place human life has in it. Hawking wants to know the mind of God. Vedanta wants to know religious truth of comprehensive meaning. > Sarvepalli Radhakrishnan, a former Spalding Professor of Eastern Religions and Ethics at Oxford University, made a very profound observation on what religion is. His perspective propounded the view that religion is not so much a revelation to be received by us in faith, but an effort to unveil the deepest layers of man's being and get into enduring contact with them. Swami Vivekananda's succinct explanation is that each soul in our global community is potentially divine and that the goal is to manifest this divinity within. > Robert Zaehner, who succeeded Radhakrishnan at Oxford, extended the argument to what I believe is one of the most outstanding contributions to our understanding of Middle Eastern religions. He took his cue from Radhakrishnan's description and followed this with a very far reaching conclusion. He regarded the religions that were born in the Middle East as "religions of revelation". Zaehner's conclusion was that Hinduism, Buddhism and Jainism were "wisdom religions". This crucial distinction leads us to arguably the most important foundation upon which our understanding of these two groups of religions must rest. One can't possibly imagine a more scientifically valid basis for this classification. > Christian theology holds that God's revealing activity is intended for the salvation of Christians as much as the revelations in Islam are intended for the salvation of Muslims only. In sharp contrast to this, the nascent elements of Christian and Islamic thought emphasise the need for Christian and Muslim communities to discipline their followers to their respective Semitic ideals. > Christian theology tells us that the Christian 'revelation' comprises the sum and substance of the self-revealing activity of God for the salvation of Christian peoples. Huston Smith tells us that Christianity is basically an historical religion not founded on universal principles, as Hinduism is, but in visible events, historical happenings. Exactly the same may be said of Islam. The classification of these two groups of religions in this way has been made possible by their origins and content. > The most important point to concern ourselves with is that five "Gods" "revealed" themselves in one way or another to five prophets in four Middle Eastern countries for the benefit of five Middle Eastern communities. Five "revelations" in the Middle East, and nowhere else in the world! Such highly questionable claims to revelation have never been and will never be verified in any way. If we take their proselytising campaigns into account the questions grow to unimaginable proportions. > Then take the incredible evidence of violence that emanates from at least one of the revelations and the study of religion becomes a near impossible task. The benefits of identifying these marks of distinction are invaluable in the task of assessing the respective positions the religions assume in their claims to be being valid pathways to their ultimate objectives. God's overwhelming love for Middle Eastern peoples has become a long overdue matter for serious discussion. We have no choice but to confront the difficulties "revelations" as such present in other parts of the world. > This paper focuses on this distinction and the challenges that arise for the possibilities for cultural harmony of any value. The distinction between "revelation" and "wisdom" forms the starting point for discussion. This paper inevitably concludes that serious examination of these two positions will have to lead us to the conclusion that there is no scientific basis upon which cultural harmony of any kind will ever be possible. The first crucial task if there is to be meaningful discussion is to level the playing fields. Attempts have been made by Sri Ramakrishna, Swami Vivekananda and Gandhiji who went to extraordinary lengths to do this. > Mankind has been blessed with cultural diversity for many thousands of years. Attendance at the Parliaments of World Religions is a pleasant experience. But it is a never ending source of wonder that despite our experiences with perpetual religious confrontations that so often result in violent conflict we are still concerned with the subject of "harmonising" the cultures of the world. This appears to be an Indian, and more precisely, a Hindu preoccupation. > My familiarity with the study of world religions at academic level, and more especially at national and international conferences in many parts of the world leaves me with serious doubt that this objective is at all worthy of pursuance. Any attempt we make to understand mankind's cultural expressions evidences the fact that few cultures of the world take the problem of harmonisation very seriously. Some very definitely do not. > The Hindu position on this matter has been stated for many hundreds of years. And my position is that we need to understand the reasons for conflict and the presuppositions that brought several of the world's religions into existence. Understanding the purport of religions will inevitably present us with the reasons for the failure of the attempts made to make harmony a crying need in world affairs. At the Parliament of World Religions in Melbourne, a very definite decision was taken by the representatives of Judaism and Hinduism to make respect for their respective religions an abiding principle and the rejection of any kind of proselytizing. > Representatives of Native American religions, Shintoism, African Traditional Religion will probably agree that harmony with them has never been a problem. They function within comprehensible parameters and recognise the need for peace and harmony in our world. But in the case of proselytising religions from the Middle East serious questions arise about their respective origins and the scientific bases of their existence. Add to this the purpose of their missionising, proselytising campaigns and the perpetuation of communal interests and very serious questions arise. > This however is not the subject of this paper. It merely makes an appeal for the levelling of the playing fields so that some focus can be extended to some of the extreme difficulties we face when considering their claims. If there is to be sufficient application of reason to all that religions contend, then there has to be considerable discussion on precisely what levels of agreement will obtain when religions of the world dialogue. They seldom if ever dialogue to obtain consensus on their most important theological, philosophical and phenomenological foundations. This paper opines that this is a very serious difficulty. > Islam has no place for the concept of Avatar and the Christian idea of God's advent on earth is reserved for Jesus. Yet Hindus everlastingly fall all over themselves to recognise these two teachers along with many others as avatars. This paper argues that there is no justification for this. Many arguments militate against the classification of any teacher born outside of India as an incarnation of God. The concept needs very seriously to be reviewed. The search for and attainment of Truth, Illumination or whatever else it may be known as, is the Ultimate Goal in Vedantic thought. > While it may be true that the personality of the historical Krishna forms the heart of the narratives in the Bhagavatam and Mahabharata, we have in Him the basic principles of religious elucidation which transcend any discussion about His message directed at any one community of people. The point to take note of is that it is not His personality that is supreme, but the principle of Illumination that He taught that is. Thus the message of the Bhagavad Gita is that the principle of Illumination is the wisdom that is available to all persons irrespective of race, religion or culture. Krishna then is the Supreme Unity that lies behind the manifold universe. > One can say much more about this. I did not come here to preach a message, but to point to the basic principles on which we can build the concept of religious and cultural harmony with a greater sense of legitimacy. The point that has to be made is that the need exists for a more tangible basis upon we can agree on the need for cultural harmony, and that any attempt to merely speak of harmony as a convenient teaching will have lasting effect, more especially when religious objectives are so variant as to leave us floundering on what religious Truth really is. > Allow me now to turn to the second part of my paper which concerns the understanding of culture at its more empirical application and the value that must emanate from it. Many people in India are aware that 150 years ago, the first people of Indian origin landed at what later became known as the city of Durban in South Africa. During the time of the celebration of this historical event, 16 November 2010 to be exact, many things were said on radio and television, many books written and many articles appeared in newspapers and magazines. > References were often made to the suffering that the original indentured labourers and the subsequent batches of people that emigrated there endured at the seminal period of that history. To my mind, no one, no writer, no journalist, no leader, no politician asked what I regard as the most important question the context raised. > The question refers very specifically to the contribution that the Indian people should have made to their new country during the course of their one hundred and fifty year history there. Of course, there was much said about economic growth and the fruits of their labours in the form of very good standards of living that came for many through the growth of the sugarcane fields and subsequent economic growth for the whole country. But my question refers very specifically to the contribution that the people, specifically the Hindu community, should have made at cultural level. I will answer this question in just a while to allow you some time to toss the question around yourselves in your own minds. > Many of us are familiar with Swami Vivekananda's presentations at the World's Parliament of Religions in Chicago. This paper refers to a few pertinent remarks he made in his first public lecture in Colombo in January 1897 on his way home from America. I strongly recommend that you give the entire talk its deserved reading. 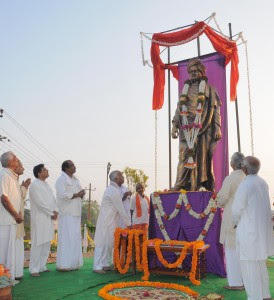 He started by urging the necessity of keeping religion as the backbone of national life in India. No doubt many have discussed and examined this contention in one way or other. My own understanding of religion after many years of study confirms this assertion with deep conviction, hence the observations and suggestions that follow in this paper. > Swamiji referred to India as the land of introspection and spirituality and then said quite openly in this regard that the debt the world owes India is immense. "For it is in India, he said, that the founders of religion were born". Many of us seriously acknowledge that many other nations have produced religions of one kind or another and live in relative comfort with them as the foundations of their respective cultures. However two or three of them, to quote Swamiji, "cast abroad their claims through the blast of war trumpets and the march of embattled cohorts and each idea had to be soaked in a deluge of blood while India has for thousands of years existed peacefully. From the time of the remote past when history has no record, from then until now, ideas after ideas have marched from India with every word spoken with a blessing behind it and peace before it". > It is in this context that we need to understand what we have to do to make these ideas flower for the benefit of the world at large. No other country in the world as far as I am aware holds a similar agenda for the sake of the cultural heritage of mankind. Each race has to make its own result to fulfil its own mission. India's gift to the world is the light spiritual and only from this source is there any possibility of cultural harmony flowing with absolute authenticity. > Reference was made to Swamiji's inspiring addresses at the World's Parliament of Religions. I have had the privilege of presenting papers at each of the four Parliaments of World Religions that have been held thus far in recent years. After the 2009 Parliament in Melbourne, I paid a short visit to New Zealand. The driver of the tourist bus I boarded in Auckland decided to strike up a conversation with me when we were alone for a few minutes. My answer to his question about what I did for a living was that I lectured in Indian Philosophy and Eastern religions at a South African university. He excitedly responded with a question that got me equally excited. "Then you have read the Upanishads" he said. His question challenged me to wonder how many bus drivers in India read the Upanishads. Or more correctly how many of India's people do? > My pain rests on the fact that while the indentured labourers who came to Natal in 1860 brought with them many artefacts that cemented their religious and cultural ideals in the new land of their adoption, very few I think brought with them copies of the Bhagavad Gita and even fewer the Upanishads. So my question concerning the contribution that some of those indentured labourers and their succeeding generations could have made to South Africa's cultural life lies in the realm of Vedantic thought. Vedanta is unique to India. My position is that, as difficult as this may be, all of South Africa's peoples irrespective of race or religion should be made aware of the elementary components of Vedanta If Hindus are to win the respect of peoples the world over, their responsibility lies in studying and teaching Vedanta. I wish this would happen in significant ways. > Allow me to make what for me is an extremely important suggestion. Two members of the International Centre for Cultural Studies and Shri Vishwa Niketan are selected to visit Washington DC in the United States and more particularly the Lincoln Memorial. They become enamoured with the size of the building, its beauty and more especially the purpose for which it was built. Abraham Lincoln stands as an outstanding role model for many Americans and perhaps others the world over. The two persons return to New Delhi to select a spot in the capital where their organisation will ask the Government of India to build an exquisitely beautiful building of Hindu design that will be named the Gandhi-Vivekananda Memorial. The building will be appreciated for its size, its dignity, its elegance, its serenity and above all its symbolic value. The two men will be recognised as arguably the most outstanding role models India and the world have produced. The statue of Swami Vivekananda installed in the building will carry a plaque bearing an extract of the speech he delivered on the 11 September 1893 at the Parliament which referred to Hinduism's recognition of all the religions of the world as pathways to the Ultimate Goal. The statue of Gandhiji will refer in its plaque to the fact that the Satyagraha movement that he started in Johannesburg on the 11 September 1906 was the Force which is born of Truth and Love and Non-violence. > While it is true that I will never accept that all religions are true and that they "lead to the same goal", I will argue that the two great men symbolise all that is great and truly remarkable in Hinduism's contributions to harmonising the world's cultural diversity. Their generous views on harmonisation will thus be cast in stone for all the world to appreciate. So while the world's many cultures stand as legacies for all mankind, such recognition must only be accorded to those cultures that reciprocate in meaningful ways. Missionising religions never do the same. We are left then with the conclusion that respect for all cultures is only possible when all cultures agree that harmonisation of cultures has very serious implications for a world that desperately needs to understand what value this has for our world. > Allow me to make what for me is an extremely important second suggestion. Two members of the International Centre for Cultural Studies and Shri Vishwa Niketan are selected to visit Bangkok in Thailand and more particularly its exquisitely beautiful Ramayana Theatre. They study the venue and attend one or more performances of the stage play on the Ramayana. They return to Bharat's city of Ayodhya to construct a similar theatre where every evening, three hundred and sixty five nights of the year, performances are staged that depict scenes from the Ramayana. The plays are filled with some of the most amazing scenes ever displayed on stage through props of unimaginable beauty enhanced by technology. The young people of Ayodhya from every religion or culture in the area are employed to participate in the plays and stage their skills in flying through the air as the vanaras did in ancient times. > Ayodhya will then be transformed into a city of outstanding entertainment and people from all parts of Bharat and the world will visit for the sake of seeing theatrical performances of amazing artistry. One of the outstanding rewards of this will be the miracle of transformation. For where at present there is strife about places of worship and their historical origins, the young people of Ayodhya will take part in theatre performances to transform the city into a place of cultural harmony of sparkling proportions. For where religion falls short on peace and harmony, theatre will replace it with the joy of performing artistry of amazing skill and participatory joy. > Let us return to Auckland and my very happy tour of the city in a bus driven by a driver who was very enamoured by the teachings of Vedanta. One of the stops on the tour was a visit to what must surely be the most beautiful Botanical Gardens in the world. I have visited other botanical gardens in other parts of the world. Ours in Durban is also a very pleasant experience. Please allow me my right to share with you the pain and the humiliation I experienced when I visited Buddha Gardens in Delhi. Am I correct in saying that when we discuss culture, and more especially cultural diversity, we have the obligation to ask how exactly culture manifests in different parts of the world? If you want the culture of Bharat to make an impression on the world you owe it to yourselves to be very aware that it is only possible to speak of such matters when you understand its implications. > I very strongly suspect that in a country like the United States institutions like the Ford Foundation, Rockefeller Foundation and other institutions have no hesitation in funding cultural projects. The question then that arises concerns the possibility of the richest families in India funding the transformation of Buddha Gardens into a botanical facility of immense pride. Botanical gardens are a cultural acquisition, a cultural necessity, and funding for such projects are a reflection on the cultural life of a nation. Until appropriate efforts are made to make the finer elements of culture stand out with pride, all talk of culture being appreciated by visitors from abroad is totally meaningless. The plea is that an application for a permanent seat on the Security Council must only be submitted when it is possible to do so with some self respect. > Let us go to Rio de Janeiro and the famous statute of Jesus at Corcovado. Jesus epitomises all that is supremely beautiful in cultural terms; the very best that western culture offers to itself and to the world. But Jesus was born as Saviour to the Christian world. Nevertheless his life and teachings have given to Christians their comprehensive culture which incorporates everything that is profoundly beautiful in it. It provides them with their moral directives followed by a host of other concerns they associate with their spiritual well being. > The question must be raised about Bhagavan Sri Krishna's advent in India 3000 years before Jesus, fulfilling a similar role in Hindu society. Bhagavan was not born as Saviour to Hindus but as Jagat Guru. The Bhagavad Gita stands as testimony to the fact that eternal life is an inherent right for all of humanity. Swamiji's words are that "Each soul is potentially divine; the goal is to manifest this divinity within". That these words stand as testimony to the fact that Hinduism has no choice but focus on cultural harmony as one of its fundamental goals, not because God, whoever that might be, revealed himself to anyone, but because the great womb of prakriti cast its seed and from it gave birth to all mankind. > However nature has decided that the privilege of appreciating this is a gift granted to the Sthithaprajna. A very small number of such people are known to history. The Gita says that when the spirit is content in itself and further enumerates the qualities that make for profound religious wisdom, then such a person is described as one of settled intelligence. The river of life is everyday living with on the one hand the ugliness of life with its pains and sorrows and on the other its joys and delights. > I don't want to go into Samadhi. I don't want to go to heaven. All I ask for is that the fresh breezes of satyam, shivam, sunderam, prem, shanti and ahimsa would blow about my heart and mind for the sole purpose of understanding what religion is and how that understanding will contribute to the betterment of the world for the sake of peace and harmony. All Hindus have a duty and responsibility to make this known to the world because it is a legacy from our Rishis who lived many thousands of years ago. Maintaining that there was no constitutional right to convert a person from one religion to another, justice P Sathasivan of the Supreme Court on Saturday said the right to propagate one's religion was not an unrestricted right. Delivering the third Dr LM Singhvi Memorial Lecture on "Secularism and Rule of Law in India," justice Sathasivam said the state has a right to pass laws restricting conversions if such activities created public disorder. Quoting from the SC's 1977 verdict in Stainislaus vs State of Madhya Pradesh & Orissa, he said: "The right to propagate means the right to 'transmit and spread one's religion by an exposition of its tenets'. But…there is no constitutional right to convert a person from one religion to another, because this would impinge on the 'freedom of conscience' guaranteed to all the citizens of the country alike." The Supreme Court delineated the boundaries of the right to propagate in the context of state legislation prohibiting forcible conversions, said justice Sathasivam, who headed the bench, which made a controversial remark against religious conversions while upholding the conviction of Dara Singh in the Graham Staines murder case last month. But the bench chose to modify it after several Christian organisations termed it uncalled for and demanded its withdrawal. On state's the right to pass legislation restricting conversions, justice Sathasivam, quoting from an SC verdict said: "the 'public order' provision of Article 25(1) of the Constitution has a 'wide connotation' and that the state could legislate conversions if they 'created public disorder." While maintaining, "Secularism is the part of the basic structure of the Constitution," he said the term 'secular' has not been defined, presumably because it is a very elastic term not capable of a precise definition and perhaps best left undefined. He, however, said in Indian context secularism meant "Sarva Dharma Sambhav" ie tolerance for all religions, which springs from due deliberation for one's own happiness and also for welfare of all beings.